Which begs the question – who’s going to give the key to their city to David Duke? Anyone? Is there any difference between Farrakhan and Duke other than pigmentation? And the keys to dead cities Farrakhan seems to be collecting? MONROE, La. 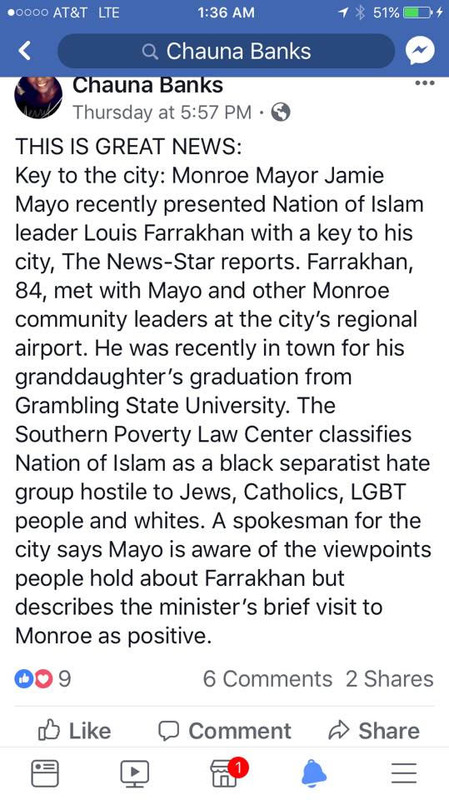 (KNOE) Mayor Jamie Mayo gave Louis Farrakhan the key at an event with other city leaders at the airport recently, where Farrakhan spoke. 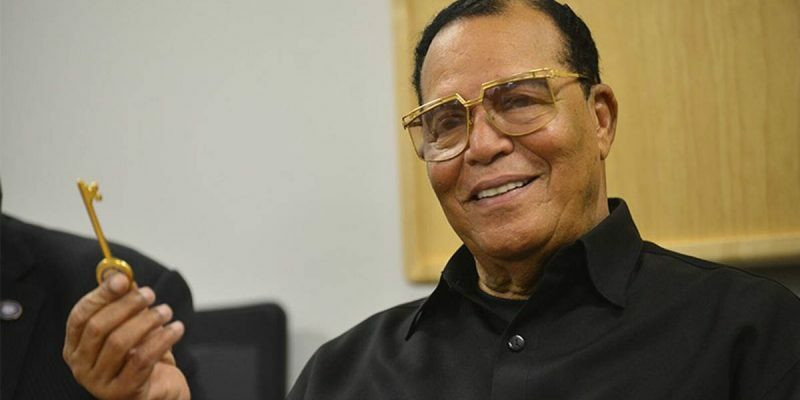 Farrakhan is a controversial figure. He leads a group called the Nation of Islam which is designated by the Southern Poverty Law Center as a hate group. It’s been reported he’s also referred to Judaism as a gutter religion and made many other comments that have been called anti-Semitic and anti-gay. City Councilwoman Juanita Woods was at the meeting with Farrakhan and said she was not aware of his past and went on to say that day he spoke of love and togetherness. “I’ve got so much admiration for this man, he spoke so eloquently about us all coming together and it was just a time of coming together and it was just a beautiful time just listening to the minister,” said Woods. The mayor’s office responded to our requests for comment saying the mayor was aware of Mr. Farrakhan’s past statements but that his visit to Monroe was positive. Farrakhan was in town because he has a granddaughter who just graduated from Grambling, so the local pols figured they’d get some mug time with him and slobber all over him while building up their black-separatist street cred. Therefore the keys to Monroe were given to America’s leading racist. Back to the Duke analogy – what do you think the consequences would be to giving the keys to a city to Duke? Would such an action result in a tourist boycott of that city? Quite likely. Would it result in corporations opting not to place headquarters or other facilities there? Maybe. How about corporations already there? Did Mayor Mayo and his collection of mental midgets consider the position they’ve put CenturyLink in? That is, after all, the largest company headquartered in Louisiana and the only Fortune 500 company in the northern part of the state. CenturyLink is headquartered in Monroe, at least for now, though there have been lots of indications that’s about to change soon – when the new CEO says he’s not going to move to the city where the corporate headquarters is, it’s not a bad bet that the HQ is moving. And now they’ve got a reason to leave. Louis Farrakhan and corporate America can’t exactly inhabit the same space. So when Mayo chooses Farrakhan he’s more or less kissing off CenturyLink. Nobody there should complain when CenturyLink departs for greener pastures. Monroe has all but given them the keys to the exits.